Book now for May and Summer Dates. Only one click away from your vacation destination. This beautiful SECOND FLOOR two bedroom two bath GULF FRONT condo has bamboo floors throughout, and tile in foyer, kitchen and baths. Master bedroom has king bed and 2nd bedroom has two Queen beds. Enjoy breath taking Views and sunsets on your private balcony or on the white sandy beaches. Afterwards enjoy fresh local seafood at one of the many nearby restaurants. If you decide to eat in, the condo is equipped with a full kitchen; there is seating for eight at the table and bar. WIRELESS INTERNET AVAILABLE IN CONDO NO CHARGE. Regency Towers offers many amenities including two large Swimming pools, children’s pool, game room, weight room, shuffle board, also a lighted tennis court. There is even a snack bar located by the pool. Gas and charcoal grills available for your grilling needs. 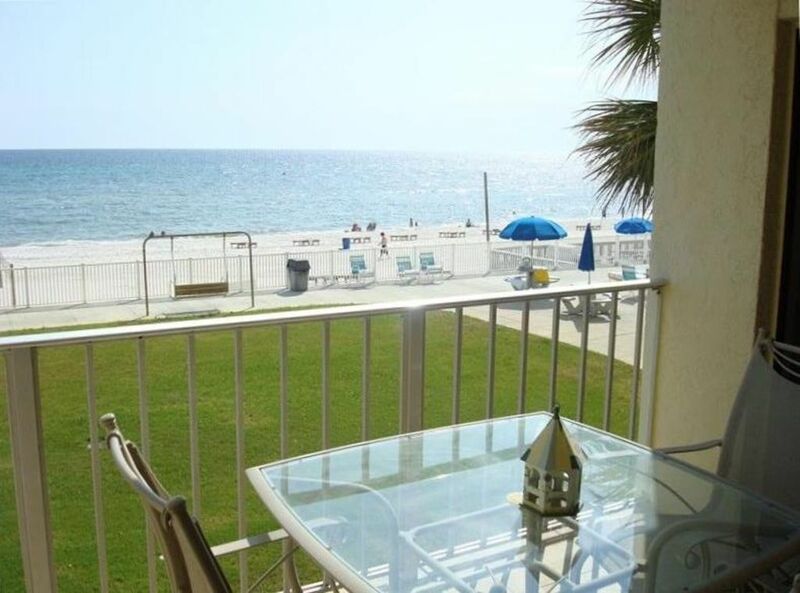 Condo is located nearby stairs for quick access to the beach. Elevators are located just a short distance away, also. Pets are not allowed on property and renters must be twenty five or older. Please feel free to contact owner if you have any questions. Low Floor NO NEED For Elevator with Quick Acces to Beach and Parking Nearby Stairway. Great place, view and beds so comfy! Will be returning! Great stay, looks just like the pictures. Reasonably priced for our 4 night stay over Labor Day weekend. Easy to get to. Restaurants, grocery stores and shopping all a short drive away. Plenty of parking at the complex. Elevator to use if needed along with carts to haul all your items up to the condo. Outstanding view from the balcony. Took us a few days to figure out the door locking system, but we finally got the hang of it. Front desk in condo lobby did not explain it. FYI, when checking in you must purchase wrist bands which are $20.00 per person. Wasn't aware this would be an additional cost for staying here. Really liked being on the second floor, easy access to the beach and pool area. Great views! Kitchen had everything we needed, spacious condo just for the 2 of us. Everything was clean except the 2nd bathroom area wasn't as clean as expected. Pointed this out to owner. Convenient outdoor café area for food and drinks. Must pay for rental of lounge chairs and umbrella on beach. Quiet area at night. Thank you for the kind words Brenda. It was a pleasure to have you in our condo. Look forward to future visits. Great guest like you make it a pleasure to rent. Our entire family had such a great time - grandparents (us), daughter, son in law and 3 grandchildren (10, 3, and 1 year old). The condo was nicely furnished with lots of room to move around. The bedrooms are beautifully decorated and comfortable. You can't beat the view from the balcony! It was nice to have a couple of beach chairs and an umbrella on the beach. My wife and I spent a lot of time under the shaded chairs watching our grandchildren play. Nice and very relaxing. The location of the room is convenient-near the stairs and the outdoor grills. We had an exceptional time and will definitely book this Unit again! Me and my best friend have stay here for a couple of years, and we love staying here. The owner is great to work with. Condo had been updated when we were there in May. WE JUST LEFT HERE ON 4/6/14 HAD WONDERFUL TIME CONDO WAS VERY NICE AND CLEAN OWNER REALLY NICE WAS VERY HELPFUL ANYTIME WE NEEDED HER TO SUM IT UP JUST AWESOME!!!!!!!!!!!!!! WILL GO BACK ANYTIME. There is an additonal $20 charge for all stay in order to gain access to property amenities and parking. This charge is collected once you check in with the front desk to gain access to amenities and parking. You will be alloted two parking passes and arm bands at this time. Stays over a month will require additional cleaning fees.